Chirag Mahajan graduated in 2011 with a BA in English Literature from University of British Columbia, Vancouver. He worked at CiTR 101.9 FM in Vancouver for 3 years, hosting live radio broadcasts and editing and producing podcasts. He then did a Professional Diploma in Audio Post-Production from Nimbus School of Recording & Media. In 2015, he assisted Audio Engineers and Record Producers in Vancouver for almost a year before moving to New York where he freelanced as a Multimedia Designer (Web, Graphic, and Sound). He left New York in late 2016 to travel across India. 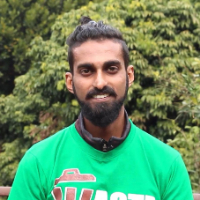 After starting to volunteer for Waste Warriors in Dharamshala in mid-2017, he was hired as a Project Assistant and soon went on to become their Project Manager, and finally moved to the Waste Warriors head office in Dehradun as their Communications Manager in June 2018, focusing on awareness-raising content writing and design, organisational branding, public relations, and fundraising. "After graduating in English Literature from UBC, Vancouver in 2011, I worked at CiTR 101.9 FM for 3 years, hosting broadcasts and producing podcasts. I then did a Professional Diploma in Audio Post-Production from Nimbus School of Recording & Media in 2015, and assisted Audio Engineers and Record Producers in Vancouver for a year. I then moved to New York, freelancing as a Multimedia Designer. I left USA in late 2016 to travel across India. I joined Waste Warriors in Dharamshala in mid-2017 as a Project Assistant, then became Project Manager, and finally moved to Dehradun as their Communications Manager in June 2018, focusing on content writing, designing, branding, public relations, and fundraising."